A smart and beautifully illustrated guide to holistic art direction. A wonderful book that will be invaluable to anyone sharing Radim Malinic’s passion for design. 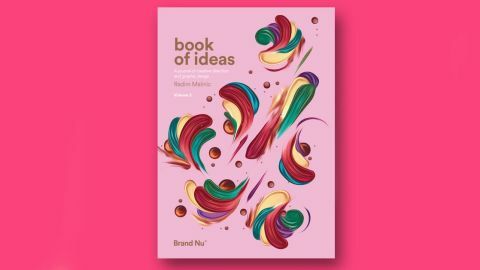 Radim Malinc’s first Book of Ideas was a surprise bestseller back in 2016, and Volume 2 doesn’t tamper with the winning formula of smart, jargon-free advice for ambitious creatives, generously illustrated by some of Malinc’s own best art direction. Czech-born Malinic has been running his successful London-based micro agency Brand Nu for well over a decade now. As well as his signature style of vividly coloured, exquisite 3D renders, he has worked across the whole gamut of design disciplines, from packaging design and branding to typography and web design. Malinic is a rare breed of illustrator who has a maintained a distinct style while also expanding his horizons and developing his craft. His insights into branding, design and living the life of a freelance creative are clearly based on many years of hard-earned experience. Malinic doesn’t just talk the talk, he’s also walked the walk. With refreshing modesty (especially for a self-illustrated design publication), Malinic admits in his own foreword that the book “won’t teach you how to design”, but should show you how to “be a better and more thoughtful designer”. This breathless, excited tone – Malinic writes like he’s going to get pulled away from his computer at any moment – is infectious; his energy and enthusiasms palpable. When he confesses that, “Many years ago when I took stock of my career so far, I came to the realisation that I was mostly average in everything that I had done so far...”, it’s impossible not to warm to his modesty. But Malinic’s work and client list tell you all you need to know about his reputation. With clients such as Coke, Adobe and Nike, he is as prolific as he is talented, but as this book proves, it’s not just skill that has taken him so far in the industry – it’s understanding himself, his clients and his priorities. The book shows how lucky breaks, chance meetings and sparks of inspiration may provide brief flashes of success, but it's tenacity, determination and utter professionalism that can propel you to the Premier League. It would be no exaggeration to describe Malinic as a self-help fanatic. His prose seems to pour out, along with page after page of stunning work, to become nothing less than an instruction manual for emotional wellbeing combined with the agility of a ‘visual athlete’. The book is divided into three sections – Work, Creativity and Mind, with each chapter broken down into mini-essays and case studies, all generously studded with insights, advice and lessons learned. The mindfulness section of the book is especially intimate, and Malinic’s openness in addressing subjects like depression and anxiety are bound to strike a chord with many readers. These frank accounts of “the demons” in Malinic’s mind reveal a genuinely open soul – this is a designer who is unafraid to show the whole artist, as opposed to just the shiny, Instagram-friendly highlights. As you’d expect for a title designed by a designer, the book is well presented, with a beautifully foiled cover and unfussy, elegant design. There’s maybe an (inevitable) bias towards aesthetics over form: the endless reversed out (white on colour) body copy does look beautiful – Malinic is a master of colour theory – but can become wearing on the eye over time. Luckily, this is a book to be dipped into and savoured, and the copy is kept brief and to the point. The uncoated paper stock also seems a strange choice. It may be synonymous in consumers’ minds with heavy duty quality, but Malinic’s electrifying, hyper-real renders are drenched in light and detail, and the matte finish diminishes the luminous glow that defines his work. A glossy paper stock might have better simulated the illuminated screens so much of this work was designed for. But these are quibbles. With his fourth publication, Malinic continues to be his own best case study, proving that his strategies and philosophies really do work. This really is a lovely, heartwarming hybrid of self-help manual and art direction masterclass.